Product prices and availability are accurate as of 2019-04-20 16:22:29 UTC and are subject to change. Any price and availability information displayed on http://www.amazon.com/ at the time of purchase will apply to the purchase of this product. PRO Tapes Premium FINE LINE Automotive Grade Masking Tape is specially formulated to leave razor-sharp paint lines on all automotive surfaces. 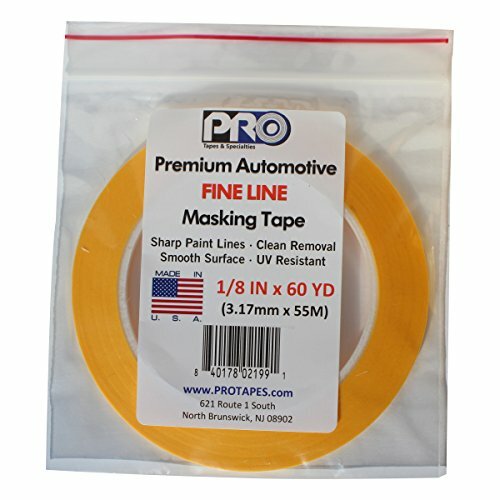 PRO Tapes Premium FINE LINE Automotive Grade Masking Tape is ultra-thin with an acrylic-based adhesive and special “Washi Paper” backing that reduces paint bleed-through and offers extended time clean removal from surfaces.